Get your beautiful and affordable "mom" jewelry at Centime! Anyone who knows me, knows that I love anything that’s personalized with my kids names on it. Anything. I have all sorts of things with the boy’s names on them already – baby blankets, Christmas ornaments, plaques and a ton more that I can’t even think of right now. I just love it when something is not only beautiful, but has special meaning to it, too. One thing has always been missing, though. A really nice piece of “mom” jewelry. You know what I’m talking about, the kind with your kids names engraved in it. I’ve been looking for that perfect piece of “mom” jewelry for years, but never really found anything that I thought would hold up to the high standards I had in my mind. Until recently. I came across a website called Centime and I immediately fell in love. Centime is a small company started by two moms who totally get it when it comes to “mom” jewelry. Like me, they didn’t want a generic piece of jewelry that you can get just about anywhere – they wanted high quality hand crafted jewelry, so they decided to start making it themselves. And that’s how Centime was born. Centime has a huge variety of pieces for sale, so something is bound to catch your eye. From necklaces to rings to bracelets and so much more. Oh, and don’t even get me started on the options for personalization on Centime. They are almost endless. Different colors, different metals (gold, rose gold, sterling silver), different fonts…see what I mean? Choose what combination of those that you like best and they will make you gorgeous pieces that not only are timeless, but that have special meaning to you specifically. I spent a good hour on the website looking through all the piece available and playing around with all of the options. The hardest part of the whole process for me is deciding what I wanted to get. I had so much trouble narrowing it down, but once I finally decided what I wanted, actually placing the order was really simple. I ended up choosing two pieces that are perfect for me. The first is this personalized mothers necklace with my three boy’s names on it. It’s so me and I have been wearing it every single day since I got it. This necklace really stands out and I love how eye catching it is. The other piece I chose was this coordinates ring. The ring is hand stamped with my home coordinates and has my boy’s names engraved inside. I just love how dainty it is. And before you ask, they figured out the coordinates for me – all I had to do was provide an address. Both of these pieces can be worn with any outfit, so I can wear them when I dress up or go casual. I have gotten numerous compliments on both pieces since I started wearing them regularly. I have to say that now that I finally have my “mom” jewelry, both pieces I got from Centime have exceeded my expectations. They are both beyond beautiful and I could not be any happier with them. I do love personalized jewelry! I gave my daughter a bracelet on the day she got married with the coordinates of the place she got hitched. I’d love to give my other daughter a piece of jewelry with her kids’ names. Oh my gosh, those are so pretty! I love the elegant design of these, and I’ve always thought personalized jewelry is so special. Everyone loves getting personalized jewelry. They make for great gifts and shows you really care and took the time to have it personalized. Oh my gosh I LOVE this! I wish I saw this before Mother’s day! I would really like this so I think I will tell my hubby what I want for Christmas early. They both look so beautiful, I would love to get one of these! Personalized items are a must and especially a great gift idea. These are absolutely awesome! I know J would never take these off. We’ve had bad luck too with her mom jewellery. My wife would love these pieces! Having it personalized is a cool added touch. Oh wow. I need these in my life. Could you imagine my necklace? That would be GORGEOUS! What beautiful pieces. WOW! These are some beautiful pieces! What girl doesn’t lover personalized jewelry? Very beautiful and sentimental only to you. I have a bracelet with my grandkids names on it that I wear all the time. These are so beautiful and they are made with prescious metals that we love. I would love to get my daughter an engraved necklace. These are so pretty and so unique! I would love a set like this! There’s something about personalized jewelry that makes it more special. I like both the ring and necklace very well made. I can tell its is a good quality as well. These pieces make the best gifts. I need to take a peak at their site! These pieces are beyond stunning! I would love a coordinates ring that shares the location of our home so I can wear it while traveling. Those are beautiful pieces! I would love a jewelry where my children’s names are engraved on it. Personalized jewelry is always the best kind. These would make amazing gifts. I love the necklace so much. My mom has also passed down jewelry to me but it’s none of this kind. It’s funny how you describe it as “mom” jewelry. Beautiful accessories to give to loved ones or as a gift to yourself. I love the coordinates ring! What a way to make sure you have your family with you no matter where you go. It’s so pretty as well! Your jewelry is so stunning! I have to check out this site. It looks like they have really amazing pieces. That necklace is fantastic! I love that it’s personalized, I would love one with my boys names on it. What a beautiful way to carry around your kids when they can’t be physically with you. I’m going to have to get some for my mom and myself! The coordinates ring is so cool! What a unique keepsake piece of jewelry. I love it so much. I love these pieces. 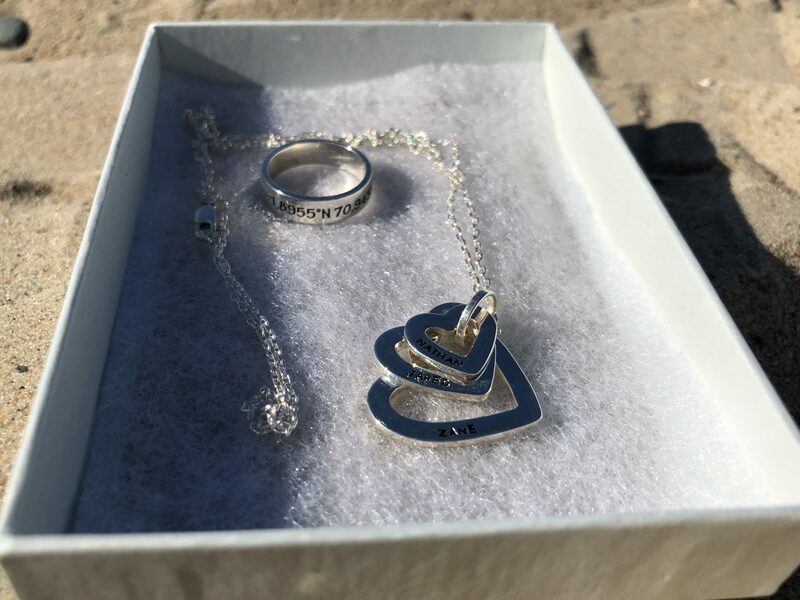 The heart pendant is unique and so is the ring. I will have to browse Centime’s website and see what else they offer. I love personalized jewelry, especially when it comes to giving it or receiving it as a gift. I had not heard of this brand before. Thanks for sharing. This is such a great idea! I love that each item is personalized and actually means something. Love these. I love anything with cordanites as I like the personalization of them. Need to check this brand out. I love personalized jewelry! These are so great – love the coordinates! Talk about beautiful jewelry that you can give to loved ones. I think it’s lovely that you have the chance to personalize it. That makes it all the more special! I absolutely love the ring with the coordinates. That is so very cool! I love personalized gift. Personalized jewerly are always special! That’s cool! I got a Mother’s Day Ring to review and love it! I’d like something with their names on it too!